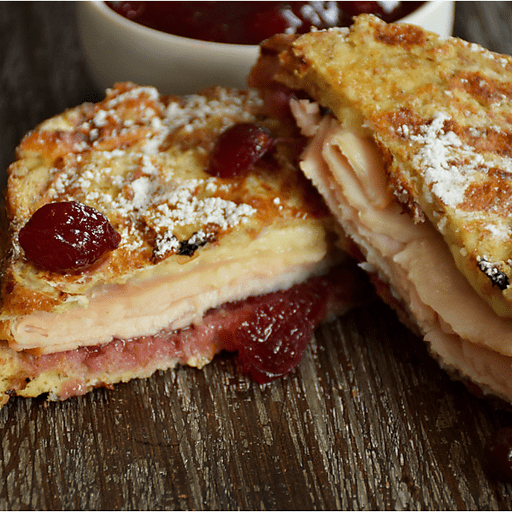 This Turkey Monte Cristo Sandwich offers a completely unexpected way to use these three fall-flavored ingredients. This scrumptious sandwich is a unique way to transform, and use up, some of those almost inevitable Thanksgiving Day leftovers. 1. Preheat nonstick skillet, griddle or grill pan over medium high heat. 1. Whisk together eggs, milk, salt and pepper in a medium bowl. Set aside. 1. Spread 2 Tbsp. of cranberry sauce onto 4 slices of bread. Top each slice with 3 oz. turkey, 1 oz. cheddar cheese, and remaining slices of bread. 1. Carefully transfer each sandwich to egg mixture and soak, pressing lightly with a spatula, about 1 minute each side. Place on skillet, griddle or grill pan. Cook until cheese is melted and turkey is hot. 1. Serve warm with extra cranberry sauce and sprinkled with powdered sugar. Per Serving: Calories 460, Total Fat 13g (Saturated 6g, Trans 0g), Cholesterol 80mg, Sodium 840mg, Total Carbohydrate 49g (Dietary Fiber 7g, Sugars 13g), Protein 42g, Vitamin A 25%, Vitamin C 8%, Calcium 60%, Iron 40% *Nutritional values are an approximation. Actual nutritional values may vary due to preparation techniques, variations related to suppliers, regional and seasonal differences, or rounding.